Well, we made it everyone. The 2018 recruting class is official and put to bed. 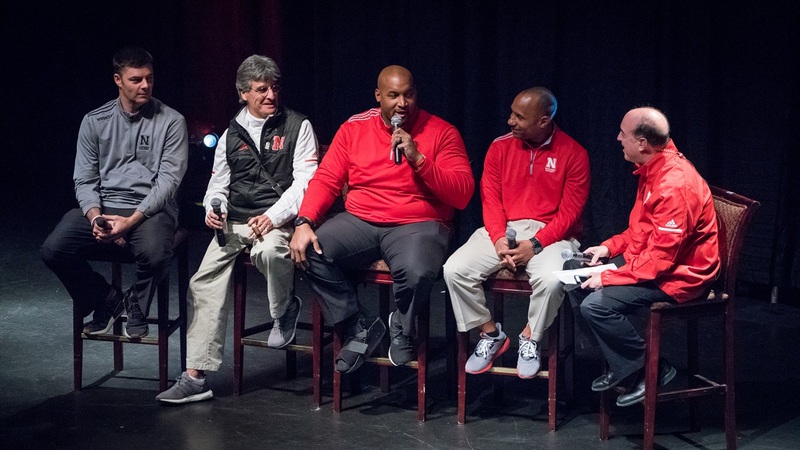 The Huskers had a very good National Signing Day, picking up five key targets including two of the jewels of the class, running back Maurice Washington‍ and outside linebacker Caleb Tannor‍. Nebraska finished with 24 signees and one transfer, linebacker/safety Breon Dixon‍. All things considered, Scott Frost and company put together an excellent class in a "transition" year. Now that the 2018 recruiting class is in the books, I’ll tackle some of the most asked questions of the cycle and give you all the inside scoop. If there are any other things you want to know, drop it in the comments and I’ll do my best to reveal what I know. >>While Nebraska fans are very happy with the class it landed, one of the most curious signing-day situations was the saga of Javontae Jean-Baptiste‍. The talented 4-star outside linebacker was coveted by Ohio State, Nebraska, Texas A&M and Virginia Tech, but had a very hard time making up his mind. So, what actually happened? Well, he was committed to Nebraska for a short period of time on Wednesday morning. Remember this tweet? It was about Jean-Baptiste. The problem was, once Jean-Baptiste had to delay his announcement because of the snow day at his school, Urban Meyer lit his phone up telling him that defensive coordinator Greg Schiano was not leaving for the NFL, but was staying in Columbus. Despite Jean-Baptiste giving the Husker coaches his word, he flipped on them and he’s off to Columbus. You can blame a snow day for Nebraska not landing a terrific pass-rushing prospect, Urban Meyer or Greg Schiano but Nebraska is moving on with the players who want to be in Lincoln. There will be plenty of opportunities to show Jean-Baptiste he made the wrong choice. >>Another situation that didn’t quite make sense to Husker fans was the departure of Joshua Moore‍. The talented 4-star wide receiver was a key part of the recruiting class under Mike Riley, and really stepped up his game as the leader of the class once Brendan Radley-Hiles‍ departed. So why did he leave the class when Frost took over despite there being an obvious match for his skill set and the offense? Plain and simple: relationships. Specifically, he and his family’s relationship with Keith Williams. Once it was apparent to the family that Williams would not be retained, and he really didn’t get consideration at all, Moore bolted. I also believe that Moore miscalculated his opportunities once he left the class in part because of all the coaching turmoil at the schools he favored once he left the Huskers class. He’s off to Texas now, but he could have been a star in this offense. >>While we are on the subject of recruits that got away, former defensive backs coach Donte Williams took a lot of heat for how his secondary performed. However, consider what he accomplished in a short time as a recruiter. Four-star defensive backs Brendan Radley-Hiles‍ (Oklahoma), Mario Goodrich‍ (Clemson), Chase Williams‍ (USC) and silent commit Christian Tutt‍ (Auburn) were all part of the Nebraska 2018 recruiting class at one point. There is an argument to be made that Williams didn’t get to show what he could do coaching-wise due to Diaco’s scheme. We will find out more from afar during his time at Oregon. >>Quarterback battles are always at the top of the list of things to pay attention to but with a new staff and scheme, Tristan Gebbia has so much intrigue surrounding him. I’m continuing to hear excellent things about his progress in the weight room. I’m told he is lifting and squatting a lot more now, and there is talk that he is close to weighing 200 pounds. He is all in on learning the offense. He spends a lot of extra time learning the playbook and studying UCF film. He has also continued to develop his leadership skills by encouraging players in the weight room after his lift and organizing sessions with his teammates. If Gebbia gets beat out for the starting quarterback job, it will not be for a lack of effort. Inevitably, things with Gebbia come back to if he can run well enough to be a threat in this offense with his legs. Gebbia is actually bigger than UCF quarterback McKenzie Milton. Gebbia is listed at 6-3, 185 currently and Milton at 5-11, 170, so in theory he should be able to take hits if Milton could. There was an interesting nugget that quarterbacks coach Mario Verduzco mentioned to me last night in Nebraska City about running with Milton. He said they didn’t run him as much as they wanted to because of his frame. That tells me that they can work around Gebbia’s size as he gets bigger if he shows he can run the offense successfully. >>The new coaching staff, Frost included, have all mentioned the difference in recruiting to Nebraska versus UCF. The power of the Nebraska brand is still strong and should only get stronger. The players they have mentioned that they couldn’t get to UCF really shows their ability to identify top talent and still build relationships. Adrian Martinez, CJ Smith, Cam Jones, Cam Taylor, Miles Jones and Will Honas have all specifically been noted as players that were much more receptive to the pitch when the staff put on red polos. In fact, Verduzco told a story on Thursday night that Smith would come around UCF to see his brother play. Smith would be respectful and would “humor” the staff, but they knew he wasn’t coming to UCF. As soon as the staff got to Nebraska though, Smith was interested, visited and became the first commit of the Frost era.